My mum was a very good cook where traditional gujarati dishes were concerned. I can’t remember her ever wanting to try out the new western dishes like pizza, tacos, burgers etc. I think she left that to my kaki and me to try out during the weekends. I will at a later stage include recipes that I learnt from my mum but for today I have to mention her most famous dish…. vaghareli rotli. My mum made the best vaghareli rotli. This simple dish is a popular meal in our household. All of us have tried to make it like mum’s but there is still something missing. I think its simply the love that she added. Everyone from us siblings to my cousins loved it when my mum made it. Vaghareli rotli can be a snack time meal tasting yummy when sprinkled with a bit of chevdo, bhusu or sev or it can be a wholesome but light dinner meal. The following recipe is for 2 as a meal, for 4 as a snack and God save you if you have to share it with my brother, Nimesh! Its his all time favourite meal on this earth. If he is around, you ain’t getting any! Put oil in a saucepan and let it get a bit hot over medium flame. In the meantime tear the rotlis into pieces. When the oil is ready, add mustard and cumin seeds to it. When the mustard seeds crackle, add the chopped garlic. Stir fry till it turns a bit pink. Add the chilli and ginger paste. Add the turmeric powder and hing. Quickly add the rotli pieces. Mix well. Add the salt and water. Mix. Let it come to a gentle boil. Add the yogurt and stir well. When you make rotlis, store the left over in the freezer. When you have a sufficient quantity, make a quick snack. Instead of chilli paste can use chopped chillis, about 1 or 2. For a more creamier consistency, use more yogurt. Oh yummmy!!! I want too!!! That's such a nice tribute to your mother! Loved the write up too! Vaghareli roti looks like a super comforting meal, prefect way to finish leftover rotis, lovely dish there Mayuri. 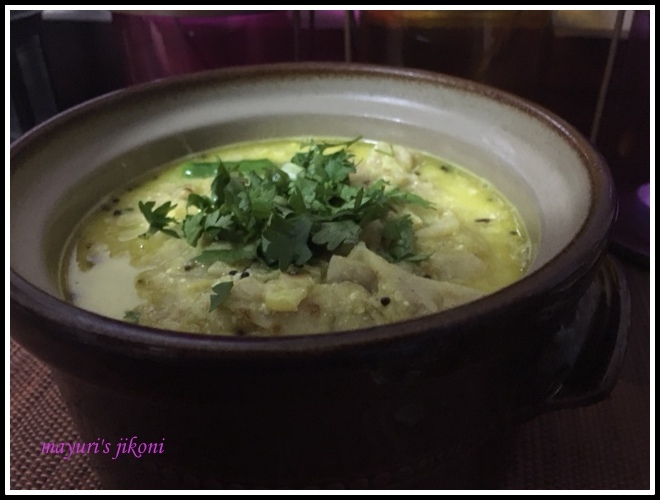 I am sure every gujju household have their own version of Vaghareli rotli recipe, in my family hubby is a huge fan of this, but I don't add garlic, I must try your recipe one day. Nice tribute to your mom Mayuri. Love the recipe. Yes I'm sure most Gujjus have their version. Some even prepare the same recipe replacing the roti with bajra rotla. Yes Priya, its a way to finish of leftover rotlis, but sometimes I make them to make this dish. Try it Sushma, am sure you'll like it. They sure are Pavani… miss her cooking. coming soon to make it for you. Vagherali roti sounds m kind of dish. I even love adding bites of roti in curry and eat that way. Nice recipe, a heirloom one. Looks delicious. Wow nice snack with rotis dear! Looks delicious! Wow I have heard about vagherali roti but reading about this yummy dish now. Mums are the best.